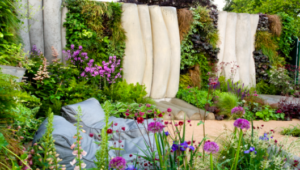 Being a city dweller and a lover of greenery all year round Living Walls really appeal to me! A ‘Living Wall’ also referred to as a ‘Green Wall’ or a ‘Vertical Garden’ is a wall partially or completely covered with greenery. Living walls include a growing medium, such as soil on the face of the wall (rather than at the bottom like green facades ) and many have integrated water delivery systems. Stanley Hart White, a professor of Landscape Architecture at the University of Illinois, invented living walls. He patented his Vegetation-Bearing Architectonic Structure and System in 1938. 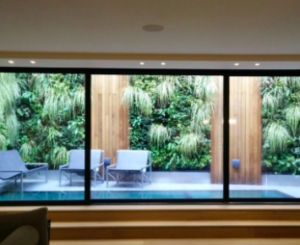 Living walls are still very popular today because they are a sustainable way to incorporate nature into urban areas. Many have been installed all around the world. The largest Living wall in London is at the Rubens at the Palace Hotel in Victoria. 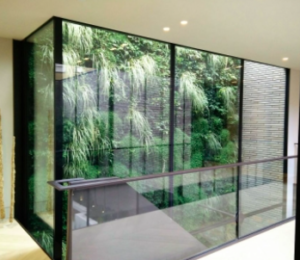 Living walls can be installed in residential and commercial settings either attached to the interior or exterior of a building or free-standing. Below is a photo of Fitbit’s Living Wall at their London Office. Excellent plants to choose for living walls include Heuchera, Thyme, Sedum, Carex and Ajuga. What are the different types of Living Wall? 1. Direct Greening– This conventional method involves the planting of self-attaching wall shrubs and climbers. This is the most inexpensive option but takes time for plants to establish themselves. 2. Indirect Greening – With this approach there is a trellis or wire for the climbers to attach themselves to. This provides an air gap between the building and the plant. 3. Living Wall Systems – Living Wall Systems use a planter box or felt, have soil to grow into and need their own irrigation system. Improve the aesthetics of buildings and create a more attractive environment in which to work or live. A living wall will improve the health and well being of people living and working in the building. A living wall will reduce the overall temperature of a building because vegetation acts as an insulating jacket keeping the building warmer in winter and cooler in summer. This can mean significant savings on heating and air conditioning bills. Contribute to the improvement of urban air quality and noise reduction. Increase the amount of biodiversity in a building by providing a home for insects. If installed in a building’s interior they can help to alleviate any problems related to Sick Building Syndrome and improve the morale of the people! I hope this post has whet your appetite to consider including one in your home or office environment!